On the evening of the seventh day of the seventh month on the Chinese lunar calendar, don't forget to look carefully at the summer sky. You'll find the Cowherd (a bright star in the constellation Aquila, west of the Milky Way) and the Weaving Maid (the star Vega, east of the Milky Way) appear closer together than at any other time of the year. 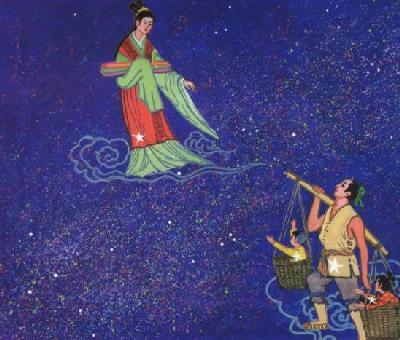 Chinese believe the stars are lovers who are permitted to meet by the queen of Heaven once a year. That day falls on the double seventh (Qixi in Chinese), which is China's own Valentine's Day. Most Chinese remember being told a romantic tragedy when they were children on the double seventh. In the legend, the cowherd and the Weaving Maid will meet on a bridge of magpies across the Milky Way once a year. Chinese grannies will remind children that they would not be able to see any magpies on that evening because all the magpies have left to form a bridge in the heavens with their wings. The legend holds that an orphaned cowherd was mistreated by his elder brother and sister-in-law, who eventually gave him an old ox and chased him out. The cowherd worked hard, and after only a couple of years he owned a small farm and house. He was lonely, however, with only the company of that faithful old ox. One day the ox suddenly opened its mouth and talked, telling the cowherd that the heavenly Weaving Maid and her sisters were going to bathe in the Silver River. The Weaving Maid was said to be the youngest of the seven daughters of the Queen of Heaven. With her sisters, she worked hard to weave beautiful clouds in the sky. The ox told the cowherd that he should go there to rob the Weaving Maid of her clothes while she was in the water. In exchange for the return of her clothes, she would become his wife. Surprised, the cowherd willingly followed the ox's instructions and hid himself in the reeds at the riverbank, waiting for the girls to bathe. The girls did come as foretold. As they were splashing about and having fun, the cowherd rushed out of the reeds and grabbed the Weaving Maid's clothing. In panic, the sisters dashed to their clothes, hurriedly put them on, and ran away. The Weaving Maid, deprived of her clothes, stood on the riverbank and tried to cover herself with her hair as best as possible. The cowherd told her that he would not return her clothes unless she promised to be his wife. After a little hesitation and with a mixture of shyness and eagerness, she agreed to his request and they married. The cowherd and the Weaving Maid lived happily together and had two children before the Queen of Heaven discovered the Weaving Maid's absence. She was so annoyed she had the Weaving Maid brought back to heaven. Putting the cowhide on, the cowherd, with his two children, went after his wife. With the help of the cowhide, the cowherd was able to follow the Weaving Maid into heaven. He was about to reach his wife when the Queen showed up and pulled off her hairpin to draw a line between the two. The line became the Silver River in heaven, or the Milky Way. The Weaving Maid went back to the heavenly workshop, going on weaving the clouds. But she was so sad and missed her husband across the Silver River so much that the clouds she weaved seemed sad. Finally, the Queen showed a little mercy, allowing the couple to meet once every year on the Silver River on the double seventh. Magpies were moved by their true love and many of them gathered and formed a bridge for the couple to meet on the evening of Qixi. It's said that it's hard to find a magpie on Chinese Valentine's Day in China, because all magpies fly to make the bridge for the Weaving Maid and the cowherd. The one thing to prove that is the feathers on the head of the magpies are much lesser after the Chinese Valentine's Day. And if it rains heavily on Qixi night, some elderly Chinese will say it is because the Weaving Maid is crying from happiness over meeting her husband on the Milky Way.